Focusing on Nehemiah, chapter 12, where the prophet led the people of God to celebrate the dedication of the rebuilding of the wall around Jerusalem—which had been completed in 52 days—Jim Shaddix, pastor of Denver, Colo., Riverside, exulted in the fact that as verse 34 says, “the joy of Jerusalem was heard far away,” as he addressed those attending Church Music Oklahoma, July 31-Aug. 1 at Oklahoma City, Southern Hills. So, why do we worship? For several reasons. We worship, Shaddix said, because God is worthy of the glory of people. Another way we worship is to express joy over Who Jesus is. 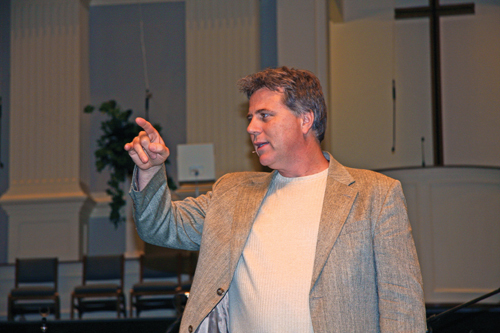 Finally, we “glorify God by exposing unbelievers to the worship of Jesus, not the worship of themselves,” Shaddix said. Shaddix focused on the “how” of worship in the conference’s final general session Saturday morning. Second, we worship with a variety of musical instruments and expressions, Shaddix said. To do so requires no small amount of preparation, he cautioned. “Our God deserves some thought put into the worship preparation process, utilizing whatever resources we have,” he urged. “It deserves planning. Shaddix also reminded pastors and those present that preaching and hearing the Word of God is every bit as much worship as singing a song or playing an instrument. “There is no worship outside the revelation of God,” he stressed. The second general session of the conference Friday afternoon featured guest artist Keith Getty, who discussed the art of hymn writing. Getty, who has been writing what have been described as “modern hymns” since 2000, said he has two goals in mind when he writes a hymn. “First, a hymn helps us express the bigness and vastness of the God of the Bible,” he said. “Second, I write songs that each generation can sing; songs which unite the body of Christ. Getty, whose musical background includes classical guitar and flute, began composing when he was 10 years old. He took those present through six songs he and his wife, Kristyn, and Stuart Townsend had written, explaining the concepts behind each piece. After he did, the audience sang each piece. Getty, who grew up near Belfast, Ireland, writes most of the music, while Kristyn and Townsend pen most of the lyrics. “By Faith” is the group’s latest song, finished about three months ago. It is based on the heroes of the faith in Hebrews. “By faith, we stand on the shoulders of those who have gone before us,” Getty reminded those present. The Gettys also joined with a mass choir and the Oklahoma Baptist Symphony in presenting a special concert Friday evening.